I don’t get to play D&D as much as I’d like these days. Which means that my enjoyment of the latest supplements chiefly depends on how fun they are to read. 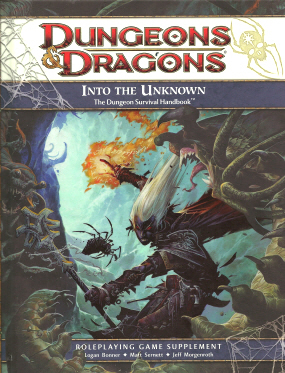 By that measure, Into the Unknown: The Dungeon Survival Handbook is one of the best books to come from Wizards of the Coast in a while. A guide for players and Dungeon Masters who want to play in a Dungeons & Dragons game that explores dungeons and plumbs the blackest reaches of the Underdark… Players will find an assortment of new powers, equipment, feats, character themes, and player races, including the kobold and the goblin. For Dungeon Masters, the book is a trove of dungeon-building advice and details, including lore on classic dungeon monsters, some quirky companions for adventurers, a few timeless treasures, and tips for incorporating players’ character themes into an adventure. Yeah, we’ve seen this book a few times over the decades. A collection of vague dungeoneering advice, some monsters that didn’t make the cut for other modules, and a few new feats. Reminiscent of the 1986 title that finally convinced me I could ignore future TSR hardcovers, The Dungeoneer’s Survival Guide. At least, that’s what I thought until I opened it. That publication was preceded by a tournament version that one could purchase only at WinterCon VIII in 1979 in a zip bag containing 40 loose-leaf pages. But even its more professionally published form, the adventure’s tournament pedigree was on full display. Discussions of scoring the players’ efforts riddle the adventure text, which presents an oftentimes nonsensical dungeon full of desperation-inducing challenges… Since then, the Ghost Tower of Inverness has appeared from time to time in various products. Most recently, it was featured in the D&D Encounters season March of the Phantom Brigade. 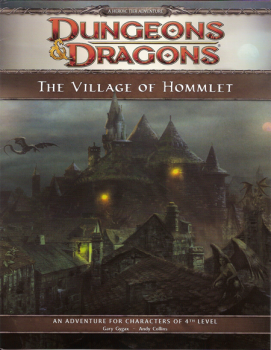 Zuggtmoy, the demonic ultimate villain of The Temple of Elemental Evil, appears with 4th Edition statistics in the Demonomicon supplement, and the Cult of the Elder Elemental Eye is discussed in The Plane Below and Heroes of the Elemental Chaos. This is cool stuff. For the first time in a long time, I feel that WotC is really celebrating the diverse and wonderful — and yes, occasionally goofy — products in its vast catalog, welcoming everything under the tent without regard to where the marketing dollars are currently being spent. Whether they intended to or not, they have warmed this old collector’s heart. More useful to modern gamers, the entries also include a “Continuing the Story” section, useful tips on how Game Masters can pick up these classic story threads for use in their own campaigns, and advice to Players on how they can prep for some of the challenges. There’s much more to the book, of course. I was especially impressed with the section on Dungeon Makers, those races who actually build dungeons, from Cultists to Duergar, Dwarves to Minotaurs. There’s terrific advice here on how keeping the Makers in mind while designing a dungeon can help establish verisimilitude and color in your setting — from the torture theaters of the Drow to the living architecture of the Mind Flayers — as well as powerful themes that can give your players clues to what they may be up against. It’s exactly the kind of thing that’s easy to do, and can have a powerful impact on play. This is one of the chapters where you find yourself wondering, why haven’t I thought of this before? There are also the obligatory pages on Dungeon Types — cave, crypt, floating castle, magic laboratory, maze, mine, volcano, etc. etc. — and some useful text on variations. For example, floating castles can be Storm Castles, Dawn Citadels, Drifting Dungeons, and Fog Fortresses. The sections on Dungeon-Themed Powers, such as Secrets of the the Deep Guides and Thieves’ Guild of the Maelbrathyr, and new Character Themes like Deep Delver, Trapsmith, and Underdark Envoy, are also entertaining and highly readable. The interior art — by Clyde Caldwell, William O’Connor, Adam Paquette , Wayne Reynolds, and many others — is universally excellent. I have one major criterion for deciding whether a D&D supplement is worth the money: does it inspire me to play? Into the Unknown makes me want to pick up my dice again. In terms of sheer inspirational value, it surpasses any title since Frostburn (2004) and Sandstorm (2005). Even if you never play D&D again, Into the Unknown is still a great value, especially for collectors and old school gamers who appreciate the fine art of dungeon design. Into the Unknown: The Dungeon Survival Handbook was written by Logan Bonner, Matt Sernett, and Jeff Morgenroth. It was published on May 15, 21012 by Wizards of the Coast. It is 160 pages in hardcover, with a cover price of $29.95.